I knew who the murderer was when I started this book. I had heard this story adapted on a BBC radio programme. This coloured my reading of the book and made me look more closely at the murderer. 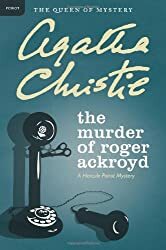 I’ve only read a handful of Christie novels, but I’ve seen a number of the mysteries adapted for TV and movies. I find her an engaging novelists. There is a quality of timelessness to her books. I knew the work was early twentieth century, but it could have been anywhere from 1900 to 1960. She gives so much more to her characters, their psychology, and relationships. This one has some great psychological bits and clues. Even knowing the murderer, I forgot how it happened precisely. I did find the murderer suspicious and there are indeed lots of character clues as well as real ones for the culprit. Hope to read more Christie soon.